Welcome to the Simon Says Stamp One of a Kind Blog Hop!!! If you're coming from May Park's blog, you're in the right place!! I have a few cards to share with use using products from the release. This first one uses the So Cool stamp and die set with the new Watermelon and Key Lime inks. I couldn't resist using the Thoughtful Bouquet stamps with my watercolors and a bit of color pencils for some extra shading. This cute little Fox was die cut and shaded with Orange Slush ink. I set him in the Fonder frame with a background of Smoke yardstick embossed with the Circle Doodle embossing plate. Next up are some tags I've created using the Fingerprint stamp set. I created an entire background of colored inks and stamped a few critters. And finally, a birthday tag with a couple of cute Chicks! Simon Says Stamp is giving away a $25 coupon to every stop on the hop from your blog comments. They will choose the winners over the weekend and will be posted on our Simon Says Stamp store blog on Tuesday. Good Luck!!! Thanks for hopping by, I hope you're enjoying the inspiration today! Oh my...what cute images. The thumbprint chickens just crack me up! Love all your cards but the new thumb print stamp is really cute!! Your tags are soon very cute! Love them all! fabulous cards and tags Shari! I always love seeing what you make! Florals are my fave! Love this release! Your cards are always inspirational! These are my two favorite new stamps and I love what you did with them! I'm simply in love with the floral, but so tempted by the cute fingerprint animals! These are all wonderful cards, you are so talented! Wow! I love what you have done with these sets!! Wonderful variety of creations. Like the multi-stamping of the Summer treats. Like the cute critter thumbprint stamping. Oh, the COLORS! Love those bright clean shades. The cards are gorgeous too! Loving that popsicle set. Oh my! An array of fabulous creations here that have me smiling so widely my cheeks hurt! The fingerprint critters have captured my heart; love your showcases of these cuties! Great projects! I love all the unique products in this release! Love everything you create and these are no exception! I'm new at this. Not sure how to get my name on here. Shelly R.
All of these are great, but my favorite is the floral card, I love this set! Wow! My favorites are the two with the fingerprint critters!! I just love them! Love all your cards! Beautiful, definitely leaning towards the flowers. So much inspiration here. Thank you for sharing your ideas, love them. Oh Shari, your cards and tags are wonderful and the Thoughtful Bouquet stamp/card is just gorgeous! I am a total tag lover so they are (of course) awesome to see... The wreath dies in this release are just stunning. I don't know how they do it but SSS sure knows what we want! TFS! I have loved all your work, and I really love the new release and what you've done with it. Gorgeous examples...love all the cards and the tags are darling! The popsicle set is my favorite. Love that little fox and all your fun samples! Your page was lots of fun! Oh my - what adorable cards and tags - love use of all the various items from this awesome release. Thanks for the inspiration! Wonderful release and excellent use of the products in your cards and tags! What a bevy of beauties.... this release is super cool. Love that fingerprint set. Thanks for inspiring. Shari - you have showcased this great release so wonderfully!! Cute fresh colorful ideas! Thank you for sharing! Beautiful cards, so many ideas! I am not typically a flower girl but I love the Thoughtful Bouquet and the way the die cuts the inside of the bouquet and not just the outer edge. Going in my cart now! Love your designs Shari!!! I esp love the thoughtful bouquet card! The fox card is my favorite but I especially love the little chick tags, too. Love how you used the popsicle border as background. Great ideas! As a senior citizen, I thought the thumb prints would not be for me, but you've proven me wrong! Oh my gosh! You went to town with Simon's great release! They are all wonderful! Popsicle adorable! Thank you. Fingerprint animals are just a hoot! What a great variety of cards. I can't choose a favorite so I guess i will have a LARGE shopping list. It was 118 here in Arizona - the popsicle treats are number one in my book! I love the Thoughtful bouquet one. off to see if I can find some videos of you, would love to see how your did it. You've really been busy creating such beautiful projects!! Thanks for sharing! So many great projects! Love the fingerprint doodles! I like way too many of things in this release! Yikes! Beautiful! I just love everything you made. I really love the texture that the colored pencil gives to the watercolor flowers. Got to remember to try that. Great cards, wonderful variety of ideas. I love the the floral card it is magnificent. I like all your cards but the flower stamp set to me is my fav of the release. Love all the adorable cards! LOVE the cute tags! Thanks for sharing, and for the chance to win. I love your cards! The designs you came up with using the new release are so fun! I can't wait to try! What great ideas. Love the flowers, the color is so vivid. Lots of bright colors, very summery! I love your use of bright colors throughout! I really like the popsicle card! Love all your bright colors. The popsicles look good enough to eat! Thanks for sharing! Such beautiful and cute cards. Such great projects! I love the popsicle card and the tags are adorable. What great projects!! I love that fox!! Love the popsicle card and stamp set. I really like the colored in Happy Birthday card. So colorful and fun. Fun! Elegant! Cute! Thanks for sharing your wonderful projects! You've been busy, Shari! Wonderful cards and tags - I am really loving those fingerprint animals. 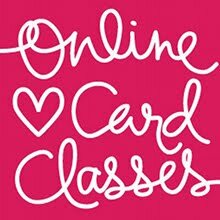 Love all your card ideas!! Inspiring to me! So many cute things in this release. but I especially love those flowers!! Thanks so much for this wonderful inspiration! I just love the fingerprint animals! I especially love the chick tag! the Popsicle card is a cute idea..and stamp of course. thanks for the inspiration. Great cards, Shari. The tags are the cutest ever. I love that stamp set with adorable animals. Love these awesome cards you created, aspacially the ones with the flowers (my favourite stamp from this new collection) and the card with the cute fox! So many fantastic creations! Inspiring! That thumbprint set just may be a must have!! Really cute and fun projects! Thanks for sharing them! The watercolor bouquet is amazing! These are all so cute! Love your color schemes, really makes your artwork stand out! I love all of them, especially your floral!! Amazing creations! Love that little fox card! Wow! So many great card samples! Love the inspiration! Love all the samples you created with this new release! So creative and colorful! 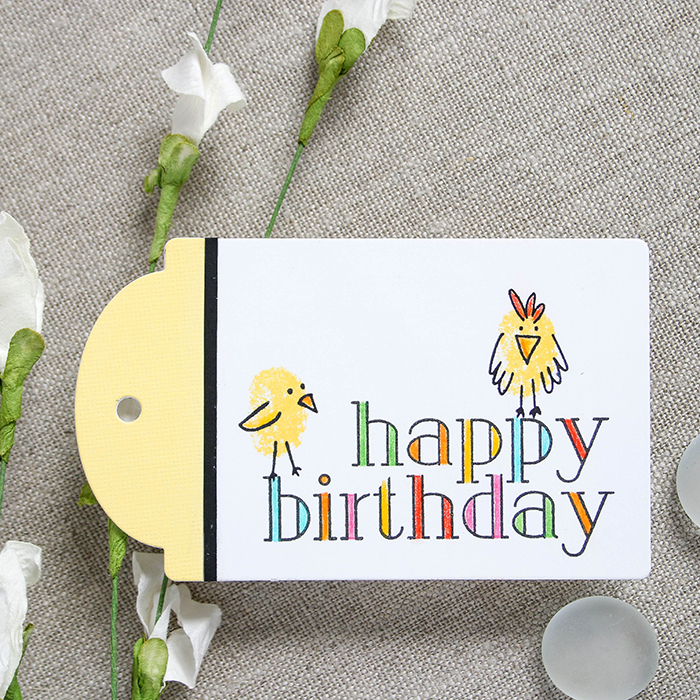 Love all these cards but especially the Happy Birthday chicks! Wow! All cards are fantastic! Thank you for sucn an inspiration! Love all your cards! Well done! Thanks so much for the inspiration! As always, you make so may clever things! The background of the ice cream card looks perfect! I love your designs. Thank you for sharing! The thumbprints cards are so adorable and playful! These are so cute! I love the ice cream and the little chickens! All these cards are so cool and fun. All are adorable but the little fox perfect. Love the cards and tags! So many great ideas coming from everyone with this release. Wow you've been busy! These are all amazing! What a great release. Thanks so much for the chance to win! I saw the fox card on Instagram and immediately adored it! Love the simple yet cute and intricate look! Your fox card is amazing! LOVE IT! So many fabulous projects! 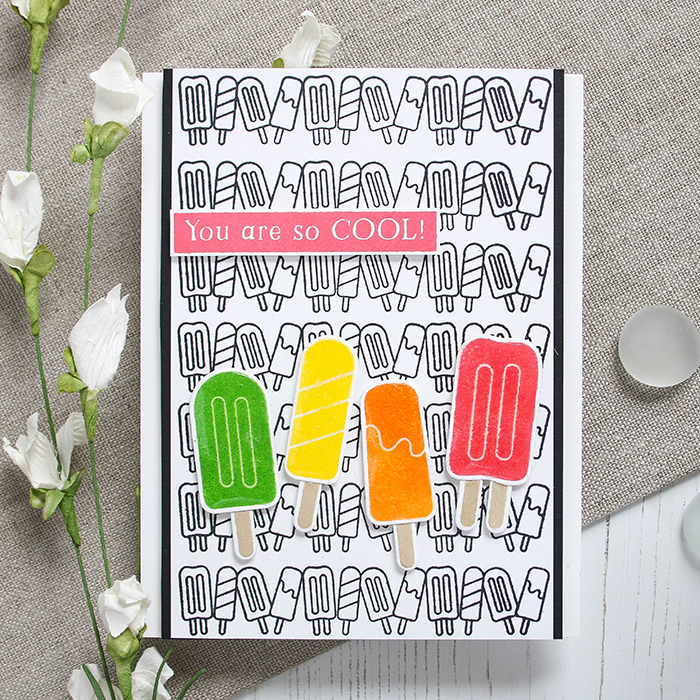 I love your Popsicle card - so fun and bright and those two new ink colors are just yummy! And your no line coloring of the flowers is just stunning. Thanks so much for sharing! Love the various skills and looks you have shared in these beautiful projects! Enjoyed seeing ideas for these great new products! You've shown us a lot of wonderful things to do with this new release. I love them all! The Birthday chicks are precious - I'm CASEing for sure! You have such a great variety, and all so well done! I love all of your samples! The thumb prints just crack me up! Love all your different projects. Gives us tons of wonderful ideas. Such a fabulous and unique release. Love the tags you created with the Thumbprint Animails. So cute, so versatile! Very pretty cards and tags. I liked the ice cream stamp, it made me want some ice cream. WOW your creations are ALL fantastic! What wonderful inspiration using this new release! Thanks so much! You had a lot of fun with this release! Super cute ideas! You have so many super cute cards - glad I do not have to choose just one! What fun! Thank you Carol for the inspiration! I love all of them. Such great ideas! Love all of these, but I just can't help falling for the fingerprint doodle animals - too cute!! Love all of your cards and tags, but the little fox is my favorite! Wow, I love all of your cards! So cute! The tags are adorable! Makes me want to buy that stamp set. Super cute cards and tags! And gorgeous flower! Fabulous set of cards Shari! Great inspiration on this awesome release! I really love your Thoughtful Bouquet card--stunning! Oh my! Every one of your creations is fabulous! Love the tag and the card with Fingerprint animals! 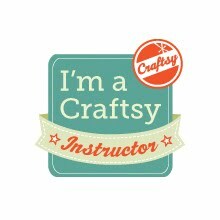 I enjoy all your projects including your mixed media creations; but I always love your cards and tags. The popsicles on the black and white background is fantastic. But I love all them. Incredible!!! Popsicle is my absolute fav!!!! Stunning!! Love then all !! The tags are so cute!! Oh Shari - these are pretty amazing, especially your coloring on the floral bouquet. Thanks for the inspiration. 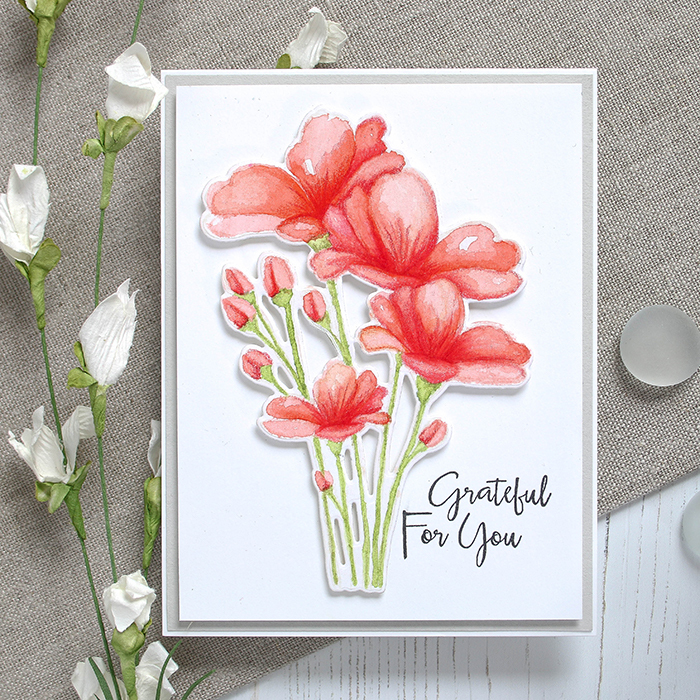 I love the floral bouquet watercolour card! So pretty! 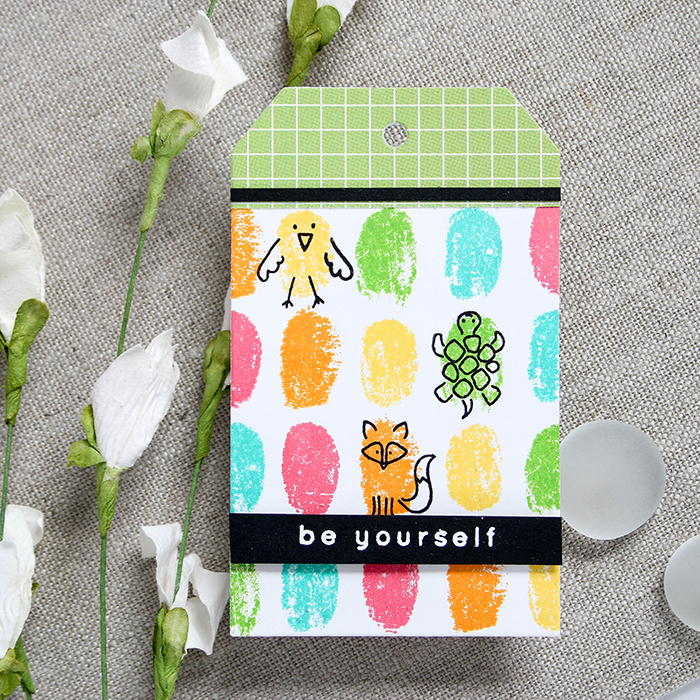 I also think those fingerprint stamps are a hoot & really like the one with the message, "Be Yourself". Such an important message, especially in this day & age. Love the little fox, he is so adorable. Also, the ice cream bars actually made me hungry. Think it's time for a little snack. Your cards are fabulous, as always, Shari! I especially love the floral one. Love the fox and wreath die together. Great idea. Fabulous array of cards. Love the new stamp sets. Wow! You were busy! I love all your cards especially the water colored one. I never thought to use colored pencil to enhance and shade a water colored image. Very clever! Thank you for all the inspiration! These are all wonderful - but I especially love that fox card! Love the background images stamped in black. Makes the foreground colors pop! These are so fun! 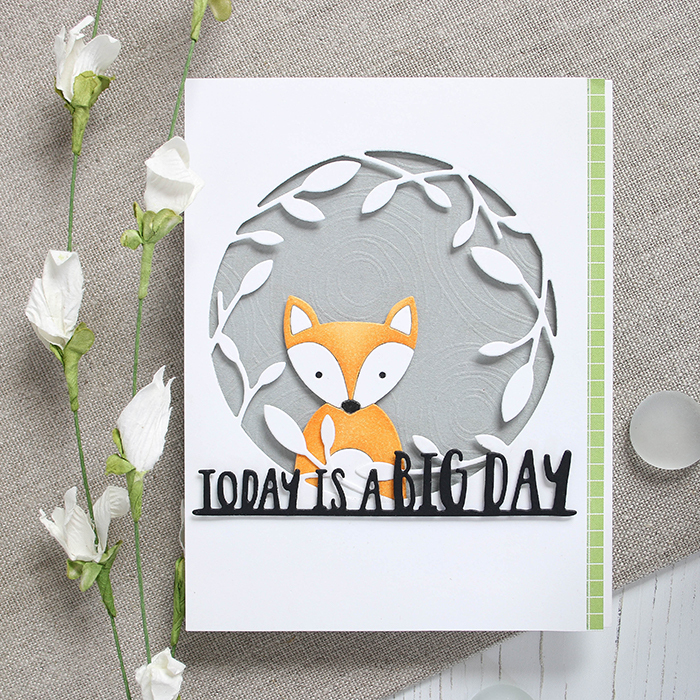 I just love that little fox and the pretty grey and orange color combination too! Great projects! Love the variety in this release. Have to say I think the fingerprint critters are my favorite! Love the tags you made. You sure design all over the board with lots of different flavors of designs. Love the versatility of this release. The little thumbprint set is too cute. And I thought the popsicle card was adorable then I started scrolling and well they are all fantastic. More cute ideas! I am going to have a hard time choosing what to buy first, wish I could buy it all. Beautiful cards! I especially love the floral one. Wow - what a great selection of cards. Each one highlighting a spectacular item in this release. Amazing!! Shari, your cards are awesome. So many ways to use these cute stamps and dies. Really loving this release! What cute ideas to use this new release! Can't wait to get my hands on all of it! I love your cards - they are beautiful. That bouquet is gorgeous! These are so cute.....I'm liking the fingerprint set more and more. #SSSOneofaKind My granddaughter and I were crafting this week and she asked, "Gram, do you have a Popsicle stamp?" When I buy this set I can tell her yes! Great cards! Love the "Be Yourself" tag!! Too cute! Love all these cards would find it very difficult to pick a favourite. Lovely card. Really like the round leaf die. Love your cards! Thank you for sharing this great release! Love the variety of cards!! I love all your cards. Each other blogger had one specific style attempted and you overachieve with so much goodness! Fabulous! Really great card! Thanks for sharing. Such fun colors used! Love the fox die! Love all these cards!! Great new products! Beautiful work! Love the colors!